The premise of the book was that poems themselves are these silver pennies. My mother, my sister, and I long celebrated "the day before April" as a holiday, a Mills family women's holiday. A decade or so ago I hosted a "day before April" party, with my mother and my boys (who did think it was a somewhat strange party) as the only guests. I usually gave my mother flowers on that day. I've dreamed of writing a book with the title The Day before April. Maybe someday I will. Today is the day before April. 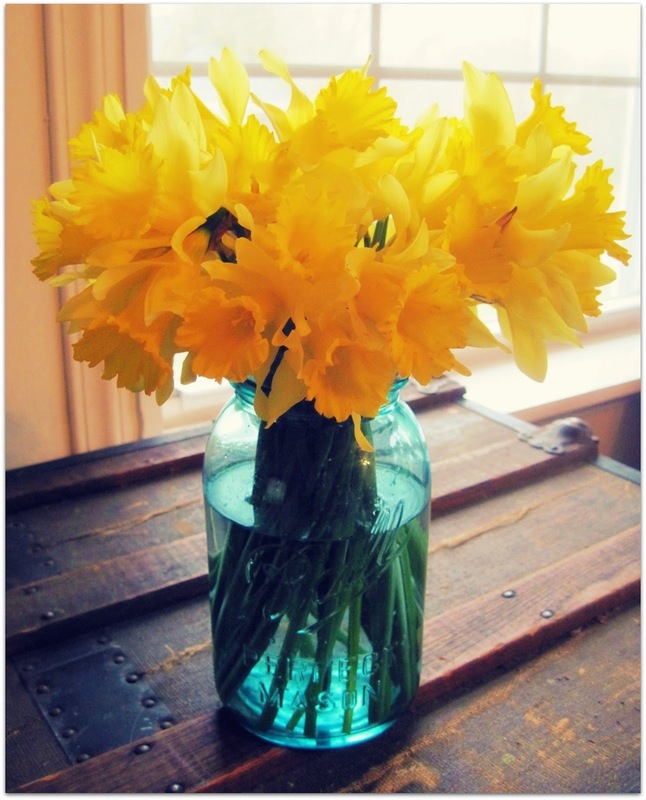 I'm going to buy some flowers - daff0dils, probably. My mother is no longer with us; she left this world in May 2010. I think of her constantly, but especially on every March 31. 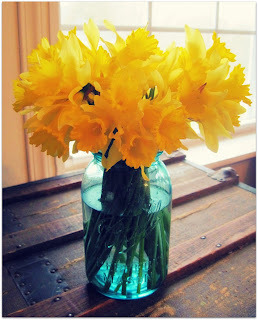 The daffodils I'll buy todaywill be in memory of her. Happy day before April, everybody. When my little granddaughters leave from their monthly ten-day visit, I send them back to their mommy with a pang of sorrow but also - I might as well admit it - with some relief that I can now regain control of my own time and my own space. The first thing I do is move all the toys from the living room (actually, from every available stretch of floor) to their bedroom, organizing as I go (all the toy tools back in the toy toolkit, all the toy medical instruments back in the toy doctor kit. etc.). Stray socks are dispatched to the laundry hamper, stray shoes to the shoe shelf. This time, once started, I couldn't stop. I cast my gaze upon my home studio/office/writing space and saw much scope for improvement. I don't mind stacks of books on the floor if they are library books recruited for a project. But I don't want standing stacks of books lacking a permanent home. So I identified some that could go to someone who might love them, not more than I do, but with more active, ardent attention. Say, those books from my college days in German, a language of which I can no longer read more than two or three words. Duplicate copies of books by friends, bought to be doubly supportive of their careers. I managed to cull 45 books from my collection, grateful that now they have the chance of actually being read, which is what every book longs for most of all. My files were next. Did I really need all my writing correspondence from 2005? Photocopies of articles used to research scholarly papers which are easily available now on the internet? I filled the recycling can to overflowing. On my way to the recycling can, I couldn't help but notice . . . .the garage. I hadn't parked in it for years as, for some reason I can't quite remember, other family members park their vehicles there while I park outside and cheerfully scrape ice off my windshield every winter morning. The night before I was to tackle the garage, I couldn't sleep, too excited at the prospect of all the decluttering I could do, which I might add, was mainly decluttering of OTHER PEOPLE'S STUFF. Advance notice had been given to the affected parties. They had promised to assist with the task after church that day. But on that 25-degree morning, I found myself out there in my threadbare nightgown, no coat, no gloves, starting to drag down duffel bags that hadn't been opened for a decade to see what I might find . . . Even greater bliss: sorting, washing, organizing, sweeping, and taking a few dozen trash bags, filled with items no longer needed or wanted here but potentially useful to others, to Goodwill. My current favorite poet, Kay Ryan, who writes spare, exquisitely crafted verse, has a marvelous short poem on decluttering, "That Will to Divest," which begins: "Action creates a taste for itself." (Go right this minute and buy her Pulitzer-Prize-winning collection The Best of It). Now that I'm done with the garage project, I'm thrilled with the results but also strangely sorrowful. Alexander the Great is said to have wept because he had no more worlds to conquer. I'm weeping because I have no more garages to declutter. not to mention - the garage. 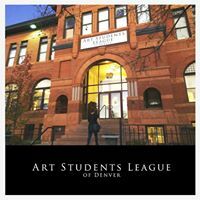 As part of my new year's goal for 2018 of providing myself with ten hours a month of creative joy, I signed up with my creative-joy-buddy Kate for a class at the Art Students League of Denver on "Travel Journaling," taught by Judith Cassel-Mamet. Kate had taken a class with Judith before and told me how wonderful it was. So off I went to Denver yesterday for a massive dose of creative joy. I woke up joyous even at the thought of taking the bus to Denver - oh, I do love traveling by bus! During the morning rush hour buses run from Boulder to Denver every five or ten minutes. I didn't even have to check a schedule; I just presented myself at the Park-and-Ride and hopped on the first Denver-bound bus that came along. Then I gave myself the treat of a nice long-ish walk from the Civic Center to the old school that houses the Art Students League. After being happy for every minute of my trip into the city, I was then happy from the minute I walked past classrooms of painters in front of their easels and found our studio, where Judith welcomed us and got us ready for the morning's artistic explorations. I loved her whole approach to travel journaling. 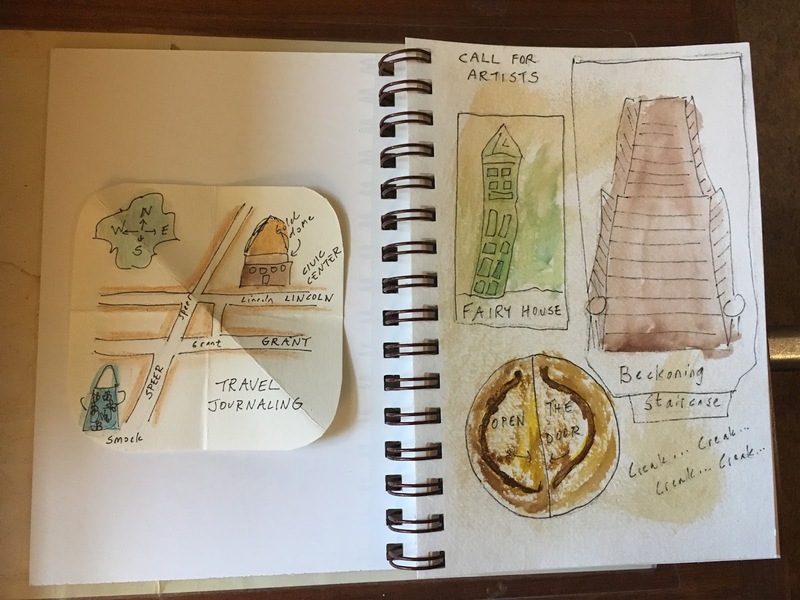 For Judith, travel is just "mindful movement," so that "even a mundane activity can be an adventure," if approached with anticipation and openness: "What is this hour is going to bring?" Indeed, she opened the class by asking us all to share some memorable moment from our trip to the class today. Mine was seeing a middle-school student skipping along - literally skipping - violin in hand. Once we began trying out Judith's journaling techniques, the class was pure play. 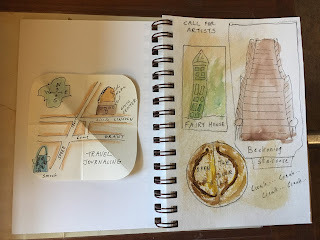 We made evocative, illustrated maps of our trip into the city. We took half an hour to wander around the Art Students League grounds noting striking images to sketch. It was fine to sketch badly; the point was just to "capture the narrative"and "anchor the experience." I'm a terrible artist. Who cares? Here's my piece from the morning. I'm not in love with it the way I was in love with the poems I wrote last month. But I was just as much in love with the process of creating it. During the class we worked with little sketching kits Judith had assembled for us, which contained a drawing pencil, Micron extra-fine pen, watercolor set, kneaded rubber eraser, and best of all, a Koi Water Brush (which could squeeze out water a drop at a time). She offered the kits for sale afterward and of course I bought one. Just looking at it makes me feel more creative. 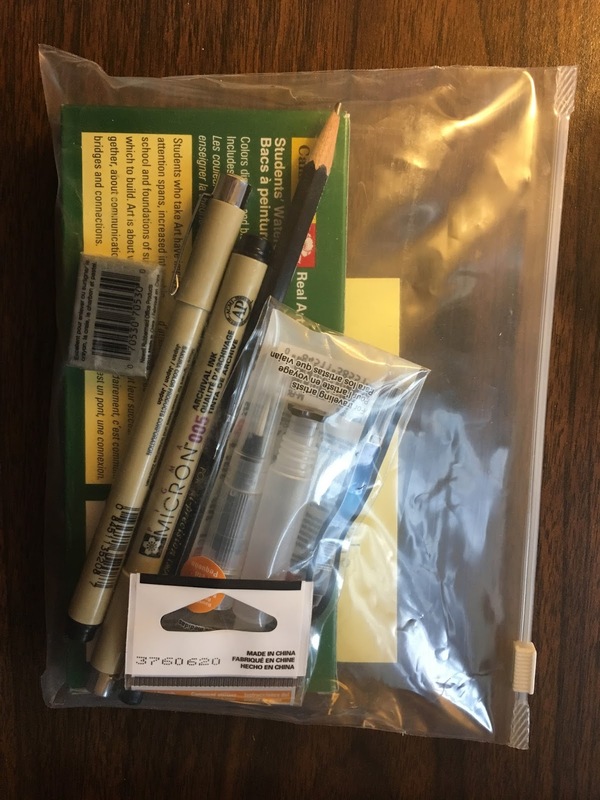 Now that I have a travel journal kit, I should schedule a magical trip for myself somewhere to use it. Judith is correct, of course, that there is plenty of magic in the everyday if we approach our ordinary surroundings as if we were visitors from a faraway land. But while I'm in a travel-journaling mood, I might as well sign up to go to an actual faraway land. Right? After all, if creative joy is my only new year's goal this year, why not provide myself with all the creative joy that I can? I've just finished an exhilarating and exhausting ten-day visit from my two little granddaughters, Kataleya (who just turned four) and Madilyne (who will be two in May). When they come to us, I'm their primary caregiver while my son (their daddy) is at work, and he leaves for work well before dawn and often works a twelve-hour day. So I am charged with filling that time with all kinds of adventures: outings to the park and library, play dates with friends, baking, play dough, and most of all, voicing stuffed animals and other imaginary friends (the current favorite, for some reason, is Big Foot). I love it more than anything in the world. And yet . . . . and yet . . . I do need SOME time just for me, especially as my editor returned my most recent draft of my chapter-book-in-progress to me for yet more revisions, which I hadn't expected. After the mandatory period of sulking and pouting over the call for more re-visioning of the story, of course I saw that that her suggestions are brilliant and the book will be a thousand times better once revised. But how could I find time to do it while also impersonating Big Foot during every waking hour for ten days? Okay. I need these hours. So how am I going to get them? Because what you need is what you have to find a way to get. And you don't get what you need just by whining about how badly you need it. I'm still working on this, but here are some ideas to put in place for their next visit. 1) Kat goes to school for four hours on three mornings during the week. During those hours I can find drop-in child care for Madi, or employ a babysitter. Madi sleeps reliably for three hours in the afternoon. During those hours I can find some other organized activity outside the home for busy, active Kat or hire someone to come play with her. This can be done! Or I can team up with other friends who are in the same situation and would like to exchange babysitting time. 2) I can leave the house when my son is home so that I won't have to harden my heart against Kat's entreaties to make Big Foot come and play. If I'm here in my (tiny) house, there is no real refuge. If I go elsewhere for an hour, that hour is mine, mine, mine. 3) For walking, I can line up friends who love to walk as much as I do and don't mind taking turns with me pushing a stroller or holding a dog leash. I can walk early. I can walk late. This brings me to another point. I need what I need, but I have to make sure I'm not just making every slight preference into a non-negotiable demand on the universe. Yes, I need an hour a day to write and an hour a day to walk, but I may have to be flexible about when those hours come to me (within reason: I can't do any real work in the evening, and that is that!). But it's unreasonable to insist on having my hour be precisely between 5 and 6 a.m., or in my house while I lounge about in my nightgown. I have to be willing to experiment, improvise, and work with second-best - which may turn out to yield its own unexpected rewards and pleasures. With careful planning, I can have the joy of playing with little girls for ten days AND write my book AND meet my daily fitness requirements. After all, this is what I need. So it's up to me to make sure I get it.